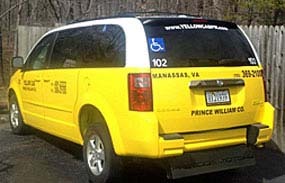 In March 2013, Yellow Cab of Prince William County added wheel chair accessible taxi service. Individuals can be transported in their wheelchair or, if able, the chair can be placed in the back with the individual in a standard passenger seat. Yellow Cab Wheel Chair Accessible transportation is curb to curb transportation. The driver is limited to loading and unloading, and securing the mobility device. At no time should the driver be required to enter a home or establishment to assist the passenger. This is for the safety of both the passenger and the driver. Our drivers are not trained medical attendants. Drivers have received training in the proper securing of mobility devices and all have passed an extensive training course through the Independence Empowerment Center and other resources. 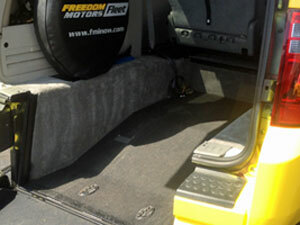 Accessible vehicles are equipped with ramps and safety restraint systems. Vehicles are ADA compliant and will accommodate standard sized wheelchairs and power chairs with four comfortable seats for other passengers. They can also accommodate standard sized scooters. It is highly recommended that a passenger on a scooter be able to transfer themselves to a passenger seat for their safety. Passengers can request immediate service, but due to limited availability, reservations are recommended. Reservations may be made an hour, a day, a week, or more in advance. Please call our dispatch line at 703-369-2100 to confirm the request is for an accessible taxi. Yellow Cab is pleased to be the only taxi cab service in Prince William County to offer wheel chair accessible taxi service. 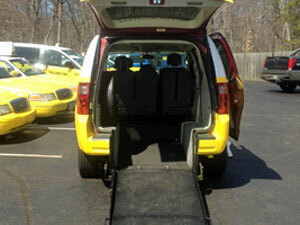 We have several rear-entry, ramped, wheel chair accessible taxis in service. These vehicles are a welcome addition to our fleet of taxi cabs. This new service is just another way we serve the citizens and visitors of Prince William County. Great new service, with the same affordable metered fares approved and enforced by Prince William County. These vehicles also accommodate standard sized scooters. It is highly recommended that a passenger on a scooter be able to transfer themselves to a passenger seat for their safety. Accessible Taxi rates are a huge savings over other forms accessible transportation. Rates are $3.00 for the initial meter activation and $0.20 for each additional 1/10th of a mile. $0.20 every 32 seconds for waiting time. Waiting time includes time spent stopped in traffic, at traffic control devices, or on customer's request.